9 year old Maryam in King Hussein Medical Center in Amman - Photo Credit: Jacki Scott. When I first meet Maryam, she is running around the Farah Center for Rehabilitation in Amman, laughing, giving high fives and snapping pictures with volunteers. She seems healthy, happy, and aside from the bandage on her head, appears as any other nine year old would be. It is hard to believe that just a few weeks earlier, she was found by her mother in a pool of her own blood. 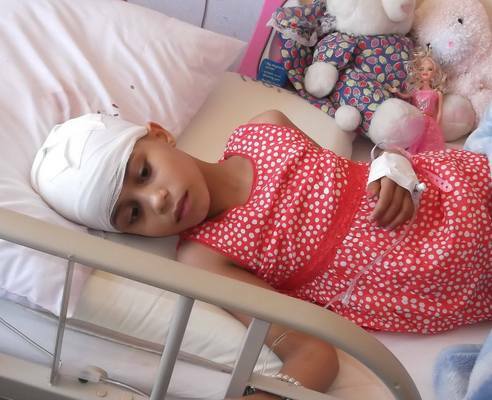 A bomb dropped next to her home in Gaza, sending her flying into the air and causing her head to crash into the base of a pillar, fracturing her skull twice. After being transferred to Jordan, Maryam remained in intensive care for a week and endured two operations to remove the shrapnel from her skull, leaving her completely paralyzed on the left side. Slowly, she regained movement in her limbs, until finally she was able to run and play again as I saw her. Unlike his daughter, however, Maryam's father is much more concerned as the date for their return to Gaza approaches. "Our home in Gaza was completely destroyed," he says in Arabic as he points to a picture of Maryam in a Gazan newspaper showing her lying in a hospital bed, surrounded by tubes. He and his family will be relying on funds collected from local and international donors to assist them in rebuilding their life in Gaza. Jacki Scott of Family Kitchen, a local NGO in Amman, has been helping to collect and distribute donations to the victims and their families in hopes of easing the transition. "These are very poor and simple people, such as farmers," Scott said. 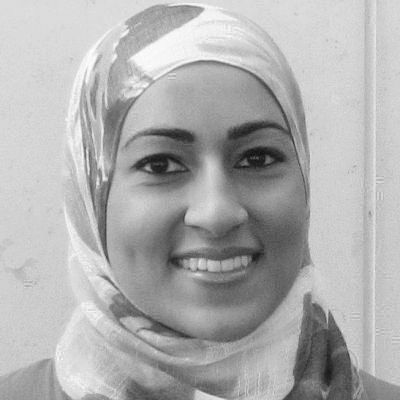 "Of all those who came to Jordan, only two had bank accounts and none of them had computers or email. Many of them came with just the clothes on their backs as there was no "warning shot" to alert them that they were about to be bombed." 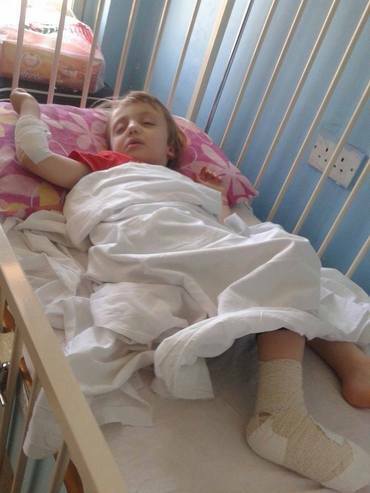 36 total victims, some as young as age 2, arrived in Jordan at the height of the Israel/Gaza conflict in July, covered in shrapnel with smashed, broken or lost limbs and endured multiple surgeries (sometimes every two to three days) to save their lives. Originally meant to go to Turkey for treatment, they found their passage blocked by Egypt. An appeal was sent to Jordan's King Abdullah II, who approved their request and allowed them to enter the country. Since then, 13 have died of their injuries while hospitalized. 2 and a half year old Hamza in King Hussein Medical Center in Amman - Photo Credit: Jacki Scott. The journey back has also not been easy for the survivors who have already gone. When 2-and-a-half-year-old Hamza attempted to cross the border with his mother, they were arrested and detained for 12 hours, despite having medical papers proving they were in Jordan for treatment. "They were concerned that the Israelis would take everything because they were going back with supplies," Scott said. "Thankfully, that has not happened so far and Hamza and his mom eventually got through." And like Maryam's family, many also have no home to return to. Some are staying at hotels or renting overpriced, poor quality homes while others, including Hala, a 27-year-old mother of four who is eight months pregnant, have no choice but to stay in shelters. "The first day back, they were being bombed and had to go to a school," Scott, who later spoke to Hala over the phone, said. "She was not fully healed and had to sleep on the floor where it was dirty, crowded, and there was no privacy. She was very frightened and later told me, 'We have no one to turn to but you.'" The United Nations Office for the Coordination of Humanitarian Affairs estimates that 108,000 people face long term displacement due to uninhabitable homes as a result of Israel's "Operation Protective Edge", which killed over 2,000 Palestinians, almost 1,500 of them civilians including 500 children and 257 women. Over 11,100 Palestinians were injured, including 3,374 children, 2,088 women, and 410 elderly. Preliminary estimates indicate up to 1,000 children will have permanent disabilities and up to 1,500 orphaned children will need sustained support from children protection and welfare sectors. Mercy Corps and the United Nations Relief and Works Agency (UNRWA), among others, have been providing assistance for the injured on the ground, but it is not sufficient, Scott says. "They are providing basic food but it is not even enough to feed children or to stave off hunger," she said. "The only people who have enough to eat are people who have money to buy food." 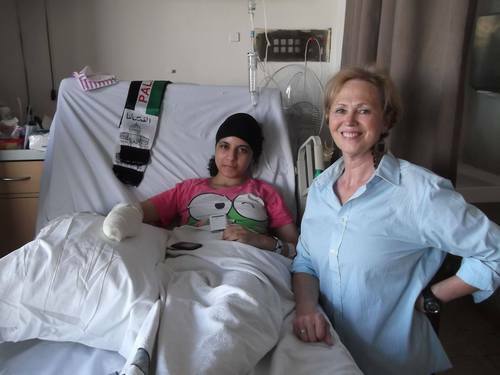 Jacki with 17 year old Rouya at King Hussein Medical Center in Amman - Photo Credit: Jacki Scott. The Palestinian government is struggling to meet the demand as well. Odai, a 14-year-old patient whose arm was completely smashed when Israeli rockets hit the UNRWA shelter where he was staying with his family, described Gaza as a "complete disaster" and said he does not believe he or his injured family members will receive assistance anytime soon. "There is so much rebuilding to do that it will take the government at least a year before it can start helping the homeless," he said. "For those who are homeless, most are in bad health, they are hungry, there are no quiet places, no rest, no security, and no money. There are no wells, electricity, or infrastructure. Everyone has to fend for themselves." Even international aid is hard to come by, as money transfer companies such as Western Union have blocked funds from Western countries, including the U.S. and Canada, from being sent to Gaza. Instead, Scott has been instructing donors to send money to Jordan first so that she can give it directly to the victims remaining in the hospital or send through a local Western Union to Gaza. "This is all political," she says. "Without water or electricity, they are boycotted, basically. They are just trying to kill the Gazans." For Maryam and the other patients, it is certainly a harsh reality that they must face as they begin the long and difficult road to recovery. For more information, please email Jacki Scott at jkiscott@gmail.com.